While we have been hearing rumours about multiple Xiaomi phones, the company seems to be gearing up to launch some of them later this month. 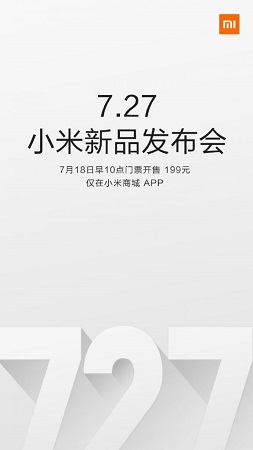 Xiaomi has sent out press invites for its upcoming launch event scheduled for July 27 in China. While the invite doesn’t reveal any details about the products expected to be unveiled at the event, one of the company’s director revealed that two new products are expected to be showcased at the upcoming launch event. While it was very much expected, the first product expected at the upcoming Xiaomi launch event is the new Redmi Note 4. The smartphone had recently surfaced and even revealed the dual rear camera setup. Interestingly, Xiaomi is apparently also planning to launch a laptop which would be called Mi Notebook and would be available in 12.5 inch and 13.3 inch variants.